Founded in West Humboldt Park neighborhood, Sacramento and Walton. 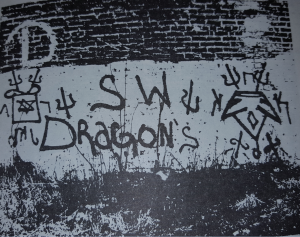 Internet Sources have said that the Insane Dragons started in the year 1964 at the corner of Augusta and Kedzie and that they were a Latin King faction that broke away back in 1964, well that is not exactly accurate. This story actually started at Augusta and Fairfield in the East Humboldt Park neighborhood back in 1964. The Latin Kings had invaded East and West Humboldt Park back in 1964 and were rapidly colonizing both neighborhoods and one of the pieces of turf they opened was Augusta and Fairfield. The appointed leader of this section was “Caveman” and he was more than likely old school minded. By the late 1960s the Latin Kings were growing at an incredible rate opening new territory everywhere but also members were becoming disorganized and many were using hard drugs like Heroin freely, all this behavior led to the stepping down of Latin King leader “King Papo” and the writing of the “Latin Kings Manifesto” in 1972, but before then the Latin Kings of Augusta and Fairfield were not happy with how things were going within the nation and how many members were reckless and becoming a drug addicted mess. Photo from a 1980s Chicago Police manual back when they raised the pitchfork. This is from Sacramento and Walton. Caveman began to look down his nose at many fellow Latin Kings in the area and decided to break away from the nation and start his own organization in 1970. 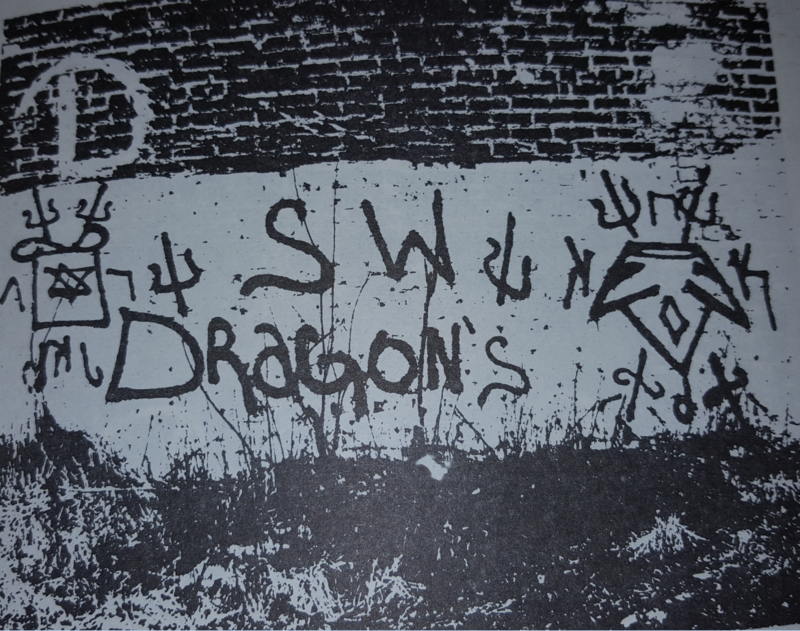 The name of the gang was the “Dragons” and the Dragons of Augusta and Fairfield kept themselves low key and acted much more organized than the other gangs all around them. The Latin Kings of course wanted revenge for the breakaway so they started a war with the Dragons, a war that the Dragons had no problem engaging in. The Dragons had strict rules of secrecy from the start and this showed when they were interviewed for a Chicago Tribune article on March 26, 1978 when the leader that referred to himself as “Joe” was really concerned about names and addresses of his members being divulged. He also talked about how other gangs are not like them and are too much trouble. He also said they had been “organized for at least 8 years,” which is how I came to the conclusion they started in 1970, there is also no history from the 1960s of any gang known as the “Dragons” and there are no street stories that are credible. Those interviewed in the article were at an apartment at Sacramento and Walton (Chicago Tribune March 26, 1978, P. 34, Greg Herrigas). In the year 1971, the section of Sacramento and Walton opened up which is where the Dragons moved their base of operations to. The Dragons opened territory in “Iowa Village” which is Western and Iowa down to Iowa and California in the East Humboldt Park neighborhood this expansion then dipped into southern West Town caused the Dragons to go to war with the C-Notes. In April, 1978 the Folk and People nation alliances were established; however, the Dragons were not accepted onto either side until 1981, they were accepted into the Folk Nation behind prison walls, and by 1983 they were visibly part of the Folk Nation. Dragons opened territory in the 1980s at Augusta and Sacramento, Chicago Ave. and Maplewood, Augusta and Rockwell “The Rocks,” Augusta and Mozart “Dragons Pitt,” and the Dragons opened major turf from Augusta Ave to Chicago Ave and Sacramento to Campbell which put them into direct conflict with the C-Notes of Smith Park. The Dragons also managed to open turf at Palmer and Kilpatrick and Austin and Diversey in the Belmont-Cragin neighborhood which brought wars with the Gaylords, Taylor Jousters and Latin Brothers. Dragons also opened territory at Iowa and Campbell “Vato Land” right near Ukranian Village and this is where the Dragons fought heavily with Chi-West very early in the 1980s. The Dragons started off as a very rapidly growing organization as they mainly centered their activity in East Humboldt Park and southern West Town. By the early 1990s, the Dragons stopped their gang wars with the C-Notes and the two became best allies. The C-Notes were in bad conflict with the Gaylords and Taylor Jousters which was great for the Dragons because they hated the Gaylords and Jousters too, due to their newer turf in Belmont-Cragin, and of course both gangs deeply hates Latin Kings. In 1991 the Spanish Cobras and Latin Disciples began shooting it out and fighting over drug turf and by 1992 it escalated into all out war that turned murderous. The ULO (United Latino Organization) was officially disbanded in place of three rival gang families. The Dragons made their choice and joined the Insane Family because Maniac Latin Disciples were trying to move in on Dragon’s turf at California and Thomas. The Dragons now became the“Insane Dragons.” After the IDRs joined the Insane family they went to war with the Maniac Campbell Boys of Lemoyne and Campbell because they were trying to open turf south of them. Other legendary Folk Nation rivalries of the IDRs were with the Maniac Latin Disciples, Harrison Gents and Imperial Gangsters but of course the biggest enemy would still be the Latin Kings. The IDRs had always been a ferocious gang but small in size. Dragons have been well run and organized since the start and that is why the Dragons have only lost two sections in all their existence Diversey and Austin and Chicago Ave and Maplewood. Their biggest suburban concentration has always been Harvard, IL. What year did the Dragons open up in East Humboldt Park? What year did the Dragons open Diversey and Austin? What year did it close and why? What year did Chicago Ave and Maplewood fall and why?